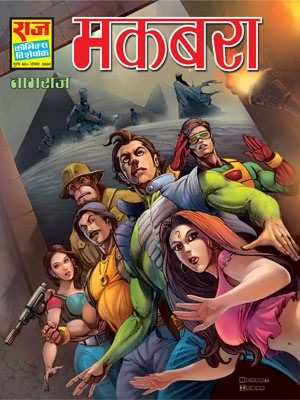 Makbara or Maqbara as what google is recommending us is the latest comics from Raj comics publication it is the set number 4 of 2012. As you know this is the Sarv nayak year , which means that all the super heroes will come back in action.Though we are still waiting for Ashwaraj, Bhokal, Yodha and Parmanu comics. Back to the new comics, the story of Maqbara revolves around Egypt where Nagraj Gagan, Vinashdoot, Monti are back in action fighting crime. It so happens that a evil demon with a power that of gods has come back to earth, he wants to defeat the Sun and the Earth. Gods have sent a message saying our super heroes, Nagraj, Vinashdoot and Gagan are the only saviours who can save the planet. Will the comics do well, we can’t say, as of the story it seems that God is coming too often to visit Nagraj these days, do you remember New World Order and Order of Babel where Gods have come for the help of Nagraj. Hopefully this comics will be scary, and filled with action. Apart from that despite so many requests to see the captions back again in the new comics, there has been no changes. Without captions usually the story line is not clear, you don’t get an idea of where the story is going what happened in the last frame. Which I think is the only reason for the decline in the reader’s interest. You can download Makbara from Raj comics store link is provided below the comics is of 42 Rupees from the store and 50 rupees in market. Also in the new set is Super Commando Dhruv’s Show Stopper, Doga Diaries 3, Swapna Sundari from Bankelal and the 3 in one digest of Doga 9 and Bankelal 12.